Brazilian President Dilma Rousseff swore in four new ministers on Monday, her office has reported, as she reaffirmed to Congress that she is committed to reducing inflation. Former Education Minister Aloizio Mercadante and former Health Secretary Arthur Chioro will replace Chief of Staff Gleisi Hoffman and Health Minister Alexandre Padilha, respectively. Both Hoffman and Padilha recently resigned from Rousseff’s cabinet in a bid to run for public office as candidates of the ruling Workers Party in the states of Parana and Sao Paulo. “The substitutions being made at several ministries today are part of the democratic calendar, they don’t alter our course. We will continue working hard to guarantee the proper execution of our programs and the fulfillment of all our goals,” Rousseff said. Jose Henrique Paim will now serve as education minister, and Thomas Traumann will fill the post of Presidential Press Secretary. Seven other cabinet members are also likely to resign in the coming weeks; these include the ministers of tourism, agriculture, industry and trade, and human rights. The cabinet reshuffles come amid growing pressure on the government to turn around an economy that makes strides, stumbles, and then recovers. Rousseff’s greatest challenges are the depreciation of local currency the real and stubborn inflation. The real has fallen nearly 15 per cent against the greenback in 2013 and the central bank has reacted by pushing up interest rates to 10.5 per cent. On Monday, the real closed at a further 1.1 per cent decline against the dollar. Economists say inflation could rise to over 6 per cent in 2014 after reaching 5.91 per cent in 2013, according to the median forecast in a central bank survey. Rousseff has made combating inflation a central government policy, particularly after deadly riots last summer over a hike in transportation costs. On Monday, at the start of the legislative year, she told Congress: “I reaffirm our commitment to measures aimed at converging inflation to the center of the target range”. She also said she wanted to curb prices for every day consumers. Inflation has become a major constraint on growth for the middle class in Brazil. 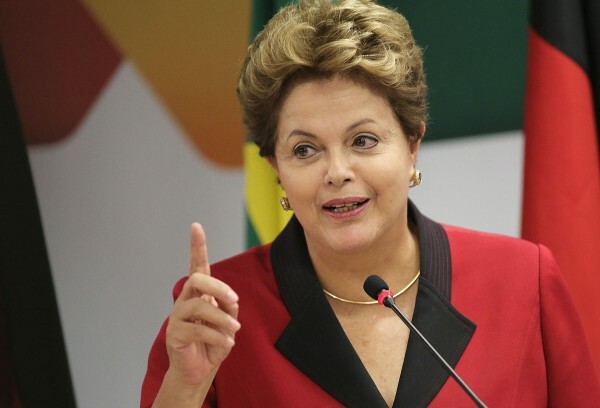 Rousseff is likely to run in the general elections scheduled for October 5. Brazil’s ability to successfully host the upcoming football World Cup and the economy are likely to weigh heavily on Brazil’s 140 million eligible voters. In December, government statistics agency IBGE said that the Brazilian economy suffered its largest quarterly slowdown in nearly five years, contracting 0.5 per cent from the previous quarter. Brazil’s gross domestic product (GDP) registered the poorest third quarter results of any country in the G20 or BRICS economic bloc in 2013.